A few facts about Search and Rescue in the Metro Vancouver area. Between the 5 teams there are an estimated 200 trained SAR members. The five teams respond to approximately 200 SAR incidents per year. This is close to 15% of all of the SAR tasks in BC, and about 7% of the entire ground SAR call volume in Canada. The combined area served by these teams is over 5000 km², and the population served is 2.4 million. The total budget for these 5 SAR groups is approximately 1.3 million¹. This means an average rescue in Metro Vancouver “costs” (in training, capital costs, and operational costs) $7000. This does not include the time of the SAR members as they are all volunteers. Each group has members trained to the same provincial standards in Rope Rescue, Swiftwater, Avalanche, Mountain, Ground SAR, Management and other tasks. Each group has its own resources such as mobile command centres, rescue response vehicles, medical aid including nurses, paramedics and doctors. The groups specialize in the types of SAR incidents in their areas and train and equip for the kinds of responses necessary. This can range from the low elevation near country of the North Shore hiking trails, urban responses in Surrey, Burnaby or Coquitlam, Marine responses to Pitt Lake and the Fraser River, or mountain rescue in the deep wideness areas beyond. 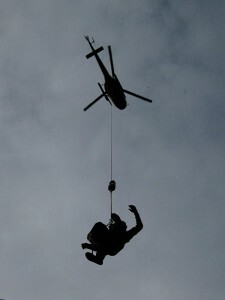 Two of these groups have advanced helicopter rescue capability – long line rescue. None of these groups have their own helicopters. We contract out helicopter services to Talon Helicopters, Valley Helicopters, and Blackcomb Aviation. Each group can send members to assist any other group in Metro Vancouver or in elsewhere in BC. When any one SAR group is over worked, they ask others to assist. Often, for large searches, SAR members are sent from other parts of BC to assist the Metro Vancouver teams. This leads to the safe delivery of SAR services across the region. These groups work together to ensure SAR services are delivered safely, and efficiently across the Metro Vancouver. The Metro Vancouver SAR groups are in fact part of the 14 groups in south-western BC – six in the Fraser Valley region, eight in the Sea to Sky region. All of these groups are part of the BC Search and Rescue Association (BCSARA), which represents all 79 SAR groups in the province of BC. Each region of the province elects a regional representative who acts in their interest. There’s a map of all of the SAR groups in BC and the rest of Canada if you are interested in seeing how many people make up our network of volunteer First Responders. BCSARA includes representatives on their board from Emergency Management BC, the RCMP, the BC Association of Municipal Police, the Justice Institute of BC, BC Ambulance Service, and the Fire Chief’s Association of BC as well as other at large positions. These represent the various stakeholders for Search and Rescue in BC. 1: This figure is derived from publicly available charitable tax returns for the groups, and does not include helicopter. ‹ Are we rescuing people too soon? Ideally, you should include the team response area maps for reference.